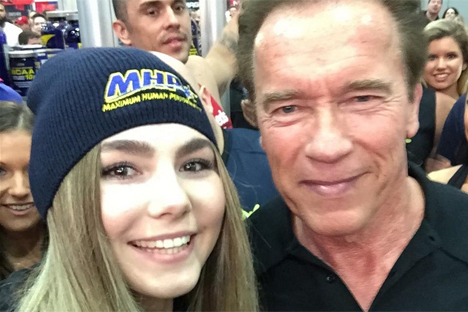 A schoolgirl from the Moscow region, Maryana Naumova who lifted 150-kilograms in the United States, handed a letter from Donbass children to Arnold Schwarzenegger, a spokesperson for the Moscow region's sports ministry said on Tuesday. A schoolgirl from the Moscow region, Maryana Naumova who lifted 150-kilograms in the United States, handed a letter from Donbas children to Arnold Schwarzenegger, a spokesperson for the Moscow region's sports ministry said on Tuesday. "The 15-year-old schoolgirl from the Moscow region, Maryana Naumova set a new world record on March 8 by pressing 150-kilograms at the Arnold BenchBach tournament as part of the world's biggest Arnold Classic 2015 sports multi-festival held in the city of Columbus (Ohio, the U.S.) on March 6 -8," the spokesperson said. The show's organizer, athlete, movie actor and ex-governor of California, Arnold Schwarzenegger congratulated the young athlete in person, the spokesperson said. "I told him that I dream of him becoming a U.S. president and definitely improving the relations with Russia. I also gave him letters and pictures that I get from children in Novorossiya. Arnold listened to me carefully and promised he will work on it," Naumova was quoted as saying by the ministry's spokesperson. Maryana's coach, Alexei Serebryakov, was denied a U.S. visa over the young athlete's trip to Donbas on a humanitarian mission, the spokesperson said. "Last October and December Maryana visited schools and sports institutions in Donetsk and Luhansk where she held children's sports events and delivered humanitarian aid. In reply, Ukraine stripped Maryana of the sports awards and titles she had received in Ukraine, and put her and her coaches on the 'list of terrorists'," the spokesperson said. Maryana Naumova is a four time world champion who has set more than 15 world records according at various powerlifting (bench pressing) federations. She is the first girl aged under 18 to be allowed to take part in professional powerlifting tournaments.